January: dismantling of the former Somerset & Dorset route between Broadstone & Blandford Forum took place, on January 18th 6523 was noted on one of the demolition trains. April: the new APCM cement works at Northfleet became rail connected, one of the first workings was handled by 6572 bringing a load of gypsum from Tonbridge via Hither Green. The official inauguration did not occur until July 24th when 6595 & 6596 were on hand to celebrate the new taffic flows. In order to work some of these traffic flows the narrow bodied Class 33/2's would be fitted with slow speed control. May: 6592 - 6595 were fitted with slow speed control. 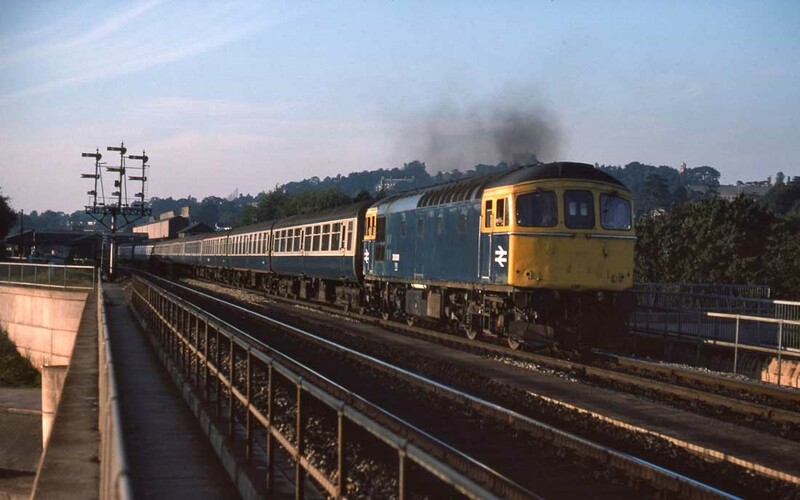 Pairs of Class 33s continued to make forays into the Exeter, Paignton, Newton Abbot area hauling excursion trains or Senior Citizen specials starting on the Southern Region. August 30th: the Atlantic Coast Limited Railtour from Worthing to Ilfracombe utilised two Class 33s including green liveried No.6566. They worked through to Ilfracombe, the line westward from Barnstaple would be closed five weeks later. August: 6596 fitted with slow speed control. Other Class 33s equipped with Slow Speed Control equipment by year's end were 6587 (December) & 6590. On November 16th the 09.08 Waterloo - Exeter St Davids and the return 14.08 to Waterloo were worked by 6517 with 4TC sets 412 & 422. Photograph courtesy Peter Lovell. An undated view, but believed to be in 1970 at Newton Abbot, of 6529 (33112) and an unidentified Class 47 on a oil tank working. Has the Class 47 failed? Or is the Class 33 hitching a ride to avoid pathing problems? Would any of the onlookers leaning on the wall to the right know? January: changes to freight diagrams on the South East Division brought further work for the Class 33's. Two Northfleet cement workings were added to LMR destinations, with Class 33's working the train to/from Willesden. Over time it was found that these trains proved to be underpowered thus the use of Class 47's was preferred. Additional coal trains were added to Northfleet, though these were diagrammed for Class 47's, although LMR Class 45's were frequently used. By the end of the year it was planned to have the APCM plant handle ninety block trains per week, comprising twenty one coal and nine gypsum trains received by the plant and sixty cement trains leaving the plant. February: 6589 was fitted with Slow Speed Control equipment. The May timetable continued to see Class 33s on the Northfleet cement workings to Dunstable, Handsworth, Manchester & Theale, though on the inter-regional workings a locomotive change would occur. A derailment at Clapham Junction on August 8th caused the stock of the 9.00am Waterloo - Exeter to be made up of 6534 & 6535 and 4-TCs 418, 406 & 410. Because no crews west of Salisbury are trained in push/pull operation it was necessary at Exeter St Davids to marshall the locomotives in the correct order for the return journey. Only 6535 was push/pull equipped so it needed to be placed next to the TC stock, even though the train was not in push mode for the rum back to Waterloo. 6541 piloted the 21.45 Exeter - Newton Abbot on August 28th, with the intent to use it for crew training. This was to allow for the Class to work empty coaching stock to Newton Abbot for berthing of the last down and first up Waterloo train of each day. This was a prelude to the replacement of the Warships by Class 33s on the Waterloo - Exeter services. It was also reported that the through Brighton - Exeter service would be discontinued at the end of the summer timetable. West Country Pacific 34023 'Blackmore Vale' and an assortment of stock was moved on September 26th/27th from Liss via Guildford & Redhill to Haywards Heath for onward delivery by road to Sheffield Park, the entourage was noted arriving at Haywards Heath behind 6570. In a move to withdraw some of the less than successful Modernisation Plan locomotives, major transfers took place affecting the Western & Scottish Region fleets. 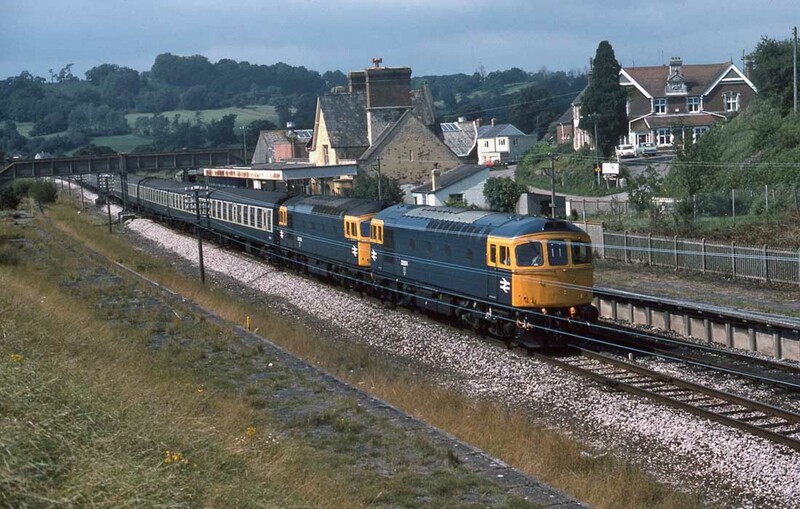 With the withdrawal of thirty Warships from Laira & Newton Abbot, the Waterloo - Exeter services were converted to Class 33 haulage utilising eight coach dual braked sets, some of which were made available from the recently discontinued Brighton - Exeter service. Previously the Warships handled ten coach sets over this route. The Class 33s had regularly filled in for the Warships on this route, as had the Class 35 Hymeks from time to time. At times of stock disruption the Class 33s had occasionally been used with pairs of 4-TC sets on this route. The use of eight coach sets on this service frequently led to overcrowding on Fridays & Sundays, an extra coach could be added providing heating was not required. The last Warship workings took place on October 3rd with 811, 812 & 823 in action. The delivery of new 4-CIG units from York during September & October saw Class 33s hauling them from Ferme Park to the Central Division. Class 33s became more frequent visitors to the southern end of the Midland main line working through to Luton on the Northfleet - Dunstable cement, then returning to Brent light to take over the Handsworth - Northfleet empties. On October 23rd a Dover - Brandon troop special was noted passing Cambridge behind 6555. January: with the withdrawal of the final WR Class 22s, the Exeter area provided new opportunities for the Class 33s. On January 3rd 6542 worked the Riverside - Newcourt on the Exmouth branch. They also became regular haulage for the 16.05 Exeter - Barnstable & 17.55 return. February: on February 26th a TC set (two three-car and one four-car) with two Class 33s pushing worked a football special from Portsmouth to Birmingham. A new motorail service commenced on May 26th, operating from Dover to Stirling, (northbound on Saturdays & Sundays, southbound on Fridays & Saturdays). The three coaches and three carflats combined with the existing Kensington Olympia - Stirling service at Kensington. The first northbound service was hauled by 6577 from Dover to Willesden and included the marshalling of the two trains at Kensington. Class 33's returned to the Portsmouth - Cardiff passenger service on summer Saturdays, working out on the 10.20am and returing on the 16.35 to Salisbury. They would later handle the 12.45 Cardiff - Portsmouth forward from Bristol. The Brighton - Exeter was again running but now operated by pairs of Hastings 6 car units on Saturdays. The service proved so popular that it would continue to run during the winter season. September 23rd: locomotives on display at Laira Open Day included 6544. On the same date a small exhibition at Brighton in support of the Woking Orphanage included 6577. February 15th: a Class 33 was tested on the Weymouth Tramway line with the intent to replace the Class 03's on the Channel Islands boat train workings. The tests were considered successful. April: on 14th narrow bodied 6594 worked through to Paignton with another Class 33 on an excursion from the Southern Region. A week later on April 22nd 6550 & 6532 reached Wolverhampton on an excursion from Clapham Junction. Also locally, the Tipton - Fawley oil tanks were noted running on Saturdays with Class 33's. In the south-east long distance excursions to Hastings were being routed over the Ashford - Ore line, a route banned to visiting Class 47's. 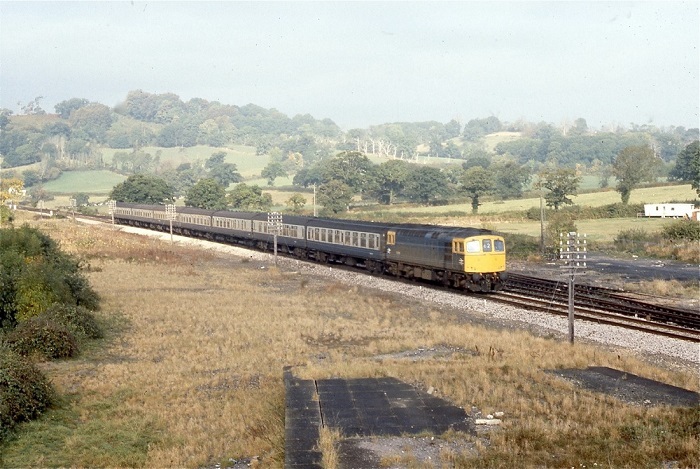 The final leg was frequently taken by Class 33's, the steep gradients near Ore frquently required the use of two locomotives. May 6th: The railway depot codes were changed from the old LMSR numeric/alpha system to a two digit alpha system. For the Class 33's their owning depots now became EH (Eastleigh) and HG (Hither Green). May: minor diagram changes saw the Hoo Junction - Thame oil workings now worked throughout by Class 33's. Elsewhere Class 25 & Class 33 combinations were occasionally noted between Plymouth & Exeter, the Class 33 assisting the regular eastbound freight when the return oil empties were minimal. June 6th: the Derby Day four coach Royal Train from Victoria to Tattenham Corner was hauled by Class 31 No. 5690. On standby duty at East Croydon & Purley were respectively 6573 & 6575. The empy coaching stock was returned to Stewarts Lane by 6578. Class 33's visiting unusual excursion destinations were 6571 (from Eastbourne) at Norwich on June 9th and 6558 (from Brighton) at Kings Lynn on June 23rd. During the summer Fawley - Coton Hill oil specials were worked to and from Bescot by Class 33's. From October Class 47's would take over this diagram. The use of the Class 33's on the Fawley - Bromford Bridge oil tanks ceased following the opening of a pipeline, although the Friday working still remained. Increasing demand for ballast from Meldon Quarry saw a Class 33 regularly working the weekday Meldon Quarry - Salisbury and return. November 22nd: 6532 worked a school excursion throughout from Brighton to Stratford upon Avon. During the first week of January the first of the TOPS renumbered Class 33's were noted. April 3rd: In order to remove failed 33112 from Taunton shed 73122 was sent to tow the errant Class 33 back to its home region for repair. April: 6508 became the last Class 33 to be renumbered into the TOPS system, as 33008. July 7th: a Ramsgate - Weston super Mare excursion was worked throughout by 33202. 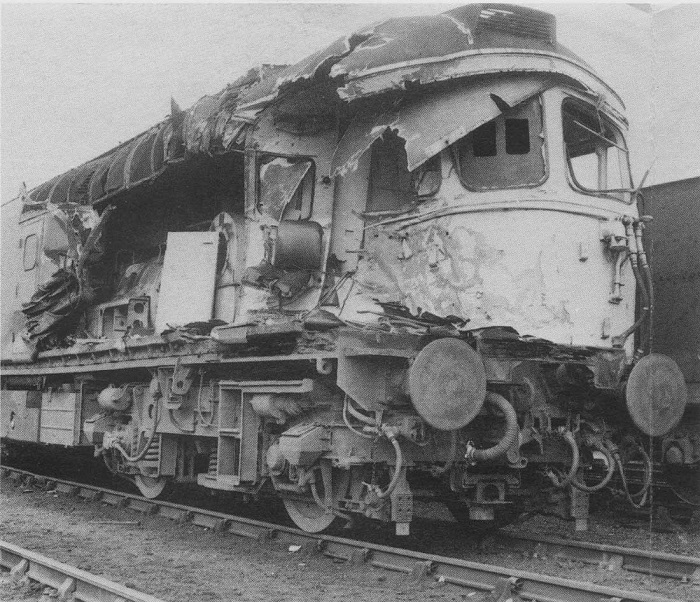 August 29th: 33058 and 4-SUB 4715 were damaged in a collision at New Cross Gate. During late September and early October 'sound testing runs' were carried with a Class 33 and eight coaches between Oxted & East Grinstead. The tests required coasting at 60mph in order to measure noise levels in reference to a new Channel Tunnel rail link. November 2nd: a railtour operated by the South Western Division utilised 33111 and 4-TC 416, RMB S1872 & 4-TC 424 from Wimbledon to Merton Abbey, Wimbledon, New Malden, Twickenham, Hounslow, Kew East Jct, Cricklewood, Carlton Road Jct, Junction Road Jct, Upper Holloway, Tottenham South Jct, Lea Bridge, Temple Mills East, Willesden Jct HL, Kensington Olympia, Acton Main Line, Southall & Brentford branch, Hanwell, Drayton Green, Greenford East Jct, North Pole Jct, Kensington Olympia, Clapham Jct, East Putney and Wimbledon. It was advertised as the last passenger train to traverse the Merton Abbey branch. Freight services on the branch were discontinued from May 5th 1975. March 16th: 33118, 4-TC 413, RMB S1872, 4-TC 416 & 33103 worked a railtour from Waterloo to North Devon, running to Meeth via Barnstaple & Torrington, then back to Crediton to take the line to Meldon Quarry. An unusual working took place on March 29th when the 20.40 Charing Cross - Hastings failed at Tonbridge with 6L unit 1017. 33203 was quickly obtained to take the train on to Hastings. On April 6th 33053 & 33041 worked a Ramsgate - Derby special throughout, running via Chatham, Bromley South, Herne Hill, Factory Junction, Longhedge Junction, Clapham Junction and reaching the Midland via reversal at Upper Holloway? On April 21st 33033 ran through the bufferstops on the down loop line at Grove Park. The Ashford & Wimbledon brakedown cranes attended six days later to rescue the Class 33. May 4th: Luton - Folkestone Harbour throughout with 33204. The locomotive worked light from Stewarts Lane to Cricklewood to collect the coaching stock. May 10th: two Ramsgate - Spalding specials, at least one worked throughout by 33041, the suffered locomotive problems at Orpington and other issues before reaching Spalding about 30 minutes late, possibly behind 33046. A Wokingham - Yarmouth excursion on June 7th was worked throughout be 33053. On the evening of June 9th a Redhill - Norwood freight hauled by 33001 became derailed between Merstham & Coulsdon South causing serious damage to the track. It would take several days to repair the damage and required the operation of a shuttle service between Merstham & Earlswood. August 22nd - 24th: a weekend Chichester - Edinburgh excursion ran to Victoria as a 3 x 4VEP which connected here with the main sixteen coach train. On the return 33051 & 33036 took the 16 coach train from Mitre Bridge Jct to Chichester via Haywards Heath & Hove. The same locomotives returnd the empty coaching stock to Clapham Jct via Three Bridges, Streatham & Herne Hill. August 30th: 33062 worked a Portsmouth - Wroxham special throughout. August: a new twice daily oil working between Fawley & Salfords, using the Coast line utilized Class 33's. September 11th: 4-SUB 4704 working the 09.02 Epsom Downs - London Bridge was run into at Bricklayers Arms Jct by the 09.42 empty coaching stock London Bridge - New Cross Gate with 33041 leading and 33047 at the rear. The collision, virually head on injured over 40 people and caused considerable damage to 33041 and the leading vehicle of the 4-SUB. October 19th: A Waterloo - Meeth special was worked throughout by 33101 & 33102 with 4-TC's 412 & 430 and RMB S1873. October: A new flow of coal commenced from Northam Yard to Didcot, running as a merry-go-round working utilising a Class 33 & Class 73. November 1st: a railtour organised by the Southern Region was worked throughout by 33102, 4-TC's 407 & 424 and RMB S1873. The train worked from Wimbledon to Broad Street, Gordon Hill (reverse), Canonbury, Carpenters Road Jct, Liverpool Street, Woodgrange Park, Fenchurch Street, Barking, Gas Factory Jct, Bow Jct, Stratford, Lea Bridge, South Tottenham and back to Wimbledon. November 6th: the Fawley - Longport oil tanks arrived behind 33016, which then returned south with the scheduled empty working. Normally on the northbound working the Class 33 would have been exchanged at Banbury for the Class 47 on the southbound working, but this was running very late. The Eastleigh driver received a pilot north of Banbury. November 10th - 13th: following on from a number of derailments of mineral wagons, a Class 33 hauling loaded and empty 16 ton mineral wagons and a test coach at speeds of up to 45mph worked several test trains. On 10th 33036 worked from Battersea Yard to Newhaven & Brighton. Later it also worked to Littlehampton & Bognor Regis. On November 13th the test train worked from Battersea Yard to Eastleigh, Reading West and back to Battersea. The next day the train ran from Battersea to Eastleigh, Westbury, Southampton, Basingstoke & Battersea. November: 33041 was withdrawn following a spectacular accident at Bricklayers Arms. The locomotive would be broken up at Selhurst during March 1976. 33010 was noted arriving at Ipswich on December 10th with a lengthy train of carflats carrying Ford Transit vans for export. 33010 then quickly returned south with empty carflats. On Christmas Eve travellers on the Waterloo - Exeter service saw 33001 & 33101 on the 15.00 service, ninety minutes later a relief ran with 33106 and two 4-TC units. From the middle of December 1975 to the middle of January 1976 Class 33s were noted on road learning specials from the Southern Region to Temple Mills. January: Oil trains worked from Fawley included destinations at Brent, Bristol, Bromford Bridge, Cardiff, Eastleigh, Hertford East, Hilsea, Langley, Longport, Old Oak Common, Oxford, Plymouth, Ripple Lane, Salfords, Scunthorpe, Tiverton & Waddon Marsh. Aprt from the Class 47 hauled Longport working, the remainder were diagrammed for Class 33's. January 3rd: a Brighton - Southend Victoria football special was worked throughout by 33021. A week later (10th) 33053 worked a Selhurst - Colchester football special throughout. March 27th: a Brighton - Hereford football special was worked throughout by 33030, running via Redhill, Reading, Newport & Abergavenny. August: the late evening Eastleigh - Nottingham freight frequently brought a Class 33 as far as Washwood Heath, the locomotive returning on the balancing working from Toton. The Fridays Only oil working from Fawley to Bromford Bridge also regularly brought Class 33's to the area. October: changes to the freight timetable saw the disappearance of a working once very familiar to the Class 33's - the cement workings from North Kent to Uddingston. Portsmouth - Wolverhampton shoppers specials were worked throughout by 33025 on November 27th & 33117 on December 4th. Of the nine freightliner workings starting from Millbrook, only the Willesden job was reguarly worked by Class 33's. January 28th: a Folkestone - Cambridge special was worked throughout by 33020. Bad weather on February 20th impacted the line between Herne Bay & Margate, with engineering work heavily curtailed and a Class 33 sustaining cab damage when it was hit by a rail. February 28th: a 'Boat & Leisure Life' show at the N.E.C. saw 33115 & 33106 bring in an excursion from Poole to Birmingham International. March 26th: a Brighton - Peterborough football special was worked through-out by 33057. The Hither Green crew had an Eastern Region conductor over the the ex G.N. route. The Brighton football specials frequently included a buffet and Pullman car, usually with a Class 33 in charge, either working throughout or exchanged at a regional boundary. 33015 is reported as working through to Bescot on April 16th & Lincoln on April 20th. April 16th: a long distance excursion for 33104, 4-TCs 420 & 433, Buffet Car 1872 & 33106 travelled from Waterloo to Cornwall. Included in the itinerary was the Fowey branch to Carne Point, Plymouth, Bere Alston, Plymouth Friary before returning to Westbury & Waterloo. April 30th: the last Brighton - Exeter service utilising the six car Hastings units took place. May 2nd: the Portsmouth - Bristol service transitioned from diesel multiple unts to hauled stock with Class 31's. It did not take too long before Class 33s began covering for failures and other operating problems. Photograph courtesy Peter Lovell. Its the evening of May 18th 1977 as 33035 and its eight coaches filled with commuters arrives at Saunderstead on one of the regular rush hour diesel hauled workings from London Bridge. On June 5th 33004 caught fire near Andover whilst working the 15.55 Exeter St Davids - Waterloo. The fire brigade were need to extinguish the fire, which caused damage to the engine room and a cab. 33021 took the train back to Andover where it was cancelled. July 16th: an Open Day at Ashford Works included 33208 as one of the items on display. July 21st: an empty oil train from the Southern Region to Milford Haven reached Cardiff behind 33014 & 33037. A Class 37 replaced the 33's which then quickly headed back east light engine. On August 7th a Haywards Heath - Peterborough (via Cambridge) special was worked throughout by 33031. August 11th: problems on the Portsmouth - Bristol found 33025 and a 4 SAP hurridly called upon to work the 16.56 to Bristol as far as Southampton. Here the 4 SAP was changed for the stock of the 13.19 ex-Bristol, still with 33025 in charge. A Class 46 had been laid on at Salisbury to replace 33025 but the Class 46 was declared a failure so the Class 33 stayed with the train at least as far as Westbury. August 12th: 33010 & 33008 reached Shrewsbury on a special from Weymouth. The locomotives and stock made the return trip on August 14th. Thunderstorms on the night of August 16th led to the closure of the Shepperton branch due to flooding at Fulwell. 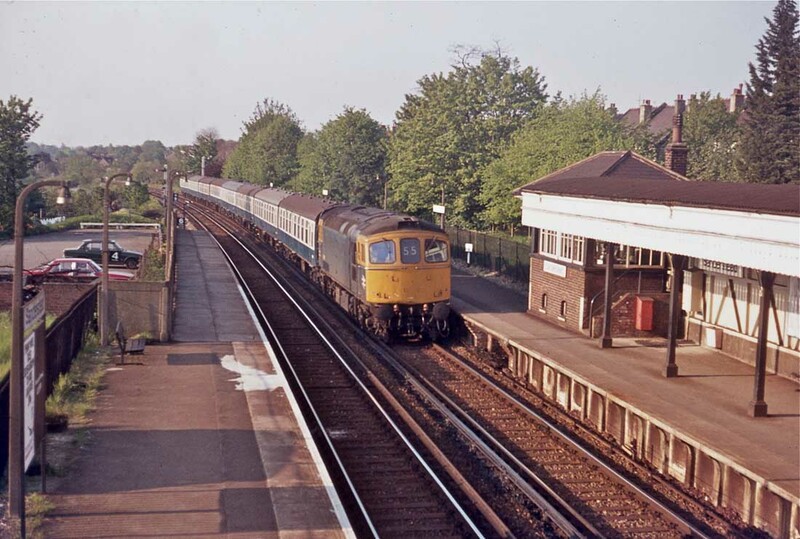 A Class 33/1 and a 4-TC provided service between Kingston & Shepperton. August: the high speed track recording coach No. DB999550, with FK S13397 & BCK S21275 visited the Southern Region late in August. On August 22nd it ran from Victoria to Brighton behind in 33047. It then worked a round trip to Bognor Regis behind 73118. Back at Brighton 33047 took over for the run to Ashford via Eastbourne. On August 23rd it traversed the Ashford , Canterbury West, Ramsgate, and Faversham route in both directions behind 73118. The next day it returned to Brighton with 33047 as far as Eastbourne, then 73118 to Brighton. 33047 handled the final leg to Victoria. On August 26th the train travelled behind 33047 from Stewarts Lane to Swanley, Faversham, Dover Priory, Tonbridge and London Bridge. Later in the day 33205 returned the track recording coach to Willesden. October: the Waterloo - Exeter acquired air-braked Mk II stock for many of its services, which contined to be diagrammed for Class 33s. October 1st: Three 4-TC sets with a Class 33 at each end were noted travelling between Great Malvern & Worcester as part of the 'Rail Ale Ramble' from Waterloo to Bath & Oxford. October 9th: a railtour from Paddington utilised 33022 & 33017 between Newton Abbot & Par. Early in the morning of October 11th a number of residents of Sidcup Road, Mottingham were awakened by the sounds of 33036 & 33043 running into several derailed coal wagons whilst hauling the 03.24 Northfleet - Dunstable cement tankers. 33036, the leading locomotive and several cement tanks derailed and ended up running down an embankment and into several of the back gardens. The trailing locomotive, 33043 also derailed but remained on the track formation and sustained fire damage when the fuel tank ruptured. Three days were required to clear the line and to repair the track. Less fortunate was 33036 and the errant cement tankers, their recovery would be prolonged as crews worked each weekend to clear them. By October 12th 33043 had reached Hither Green before moving on to Slade Green for repairs. The final recovery of 33036 took place on November 26th when 33057 hauled it to Hither Green. It would not officially be withdrawn until July 1979, being broken up at Slade Green during October 1979. Following the retirement of 33036 the class would remain intact until the withdrawl of 33104 during December 1985. 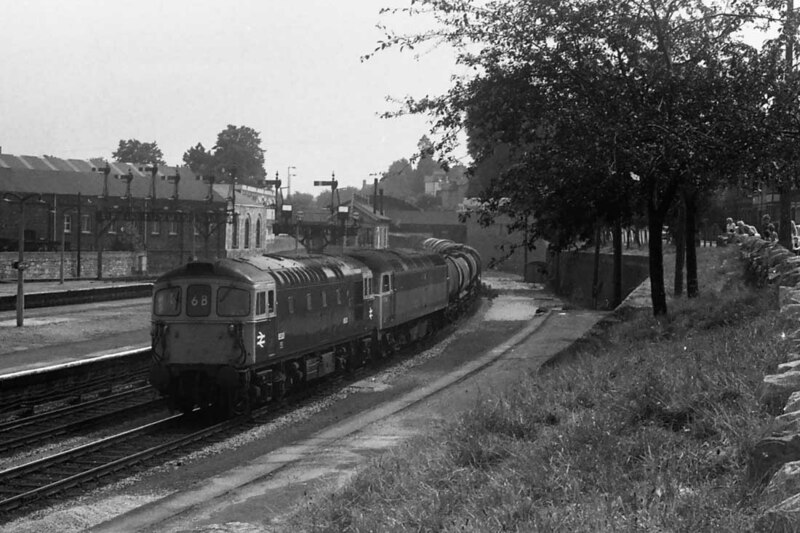 During October 1977 33033 was transferred to Hither Green, possibly to cover the loss to traffic of 33036 & 33043. An excursion from East Croydon to Barnstaple on November 5th was worked throughout by 33059 running via Hove, Salisbury & Westbury. The High Speed Track Recording Coach DB999550 returned to Kent and the London area, being noted between November 8th & 11th hauled by 33051 over various routes. On December 17th seven historic vehicles, including two steam locomotives departed Preston Park for York behind 33044. Maximum speed was 25mph, on November 19th it was noted in the London area behind 33051 and handed over to a Class 25 at Brent. On November 19th 33023 worked a Clapham Junction - Swansea excursion throughout. Also on November 19th a Brighton Football Club charter to Northumberland Park (for Tottenham Hotspur) was worked roundtrip by 33204. On December 2nd eleven historic vehicles departed Preston Park for York behind 33042. Maximum speed was 35mph except at certain locations, where a 10mph limit was imposed. Undated maybe 1976 or 1977: I have just found your site and found it very interesting. I also had a quick look for an incident which happened around the mid-1970's (76 or 77 possible) but could not find it. I thought you may be interested in the incident so enclose what I know. Unfortunately, I can not give you much detail on loco or carriage numbers as this was not of great importance to me at the time. I use to catch one of two Class 33 hauled loco services to East Grinstead from London Bridge which left about 17:10 and 17:30 ish. This particular night I court the earlier train. We got to what I believe was Upper Wallingham station when the train broke down. After about 45 minutes they brought the later train up and coupled it to the back of our train. This did not work and it was decided to bring down another 33 (I assume from Norwood) and run it round to the front and couple it to the train. This worked and we then proceeded down to East Grinstead stopping twice at every station with a double headed 8 set coupled to another 8 set. This meant 16 carriages and three 33 locos. We were about 2 hours late. If you have any information or can point me in the right direction or need any further information please let me know. February: the lengthy spell of cold, snowy, icy weather which occurred during the middle of February led to great demand for Class 33's to assist many electric services, particularly those on the Waterloo - Bournemouth route and the early morning electric workings which were most susceptible to frost & ice build up on the conductor rails. On February 1st the Decelopment Board for Rural Wales exhibition train, comprised of five vehicles was worked by 33106 from Salisbury to Tyseley. On February 5th 33027 worked the Sports Grupex exhibition train, comprised of six vehicles from Bromley North to Bristol Temple Meads. March 11th: an East Croydon - Abergavenny charter was worked throughout by 33037. The stock went forward to Hereford for servicing prior to the return journey. The next day 33050 worked a Folkestone West - Abergavenny troop special throughout. A similar movement was worked by 33046 on March 19th. On March 24th a Brighton - Cardiff football special was worked by 33064 & 33052. The next day an East Croydon - Plymouth excursion was powered by 33064 & 33057. April 4th: a Fawley - Colwick train of empty oil tanks was worked throughout by 33009, the Class 33 quickly returned light engine to Birmingham New Street to work the 17.21 New Street - Poole. 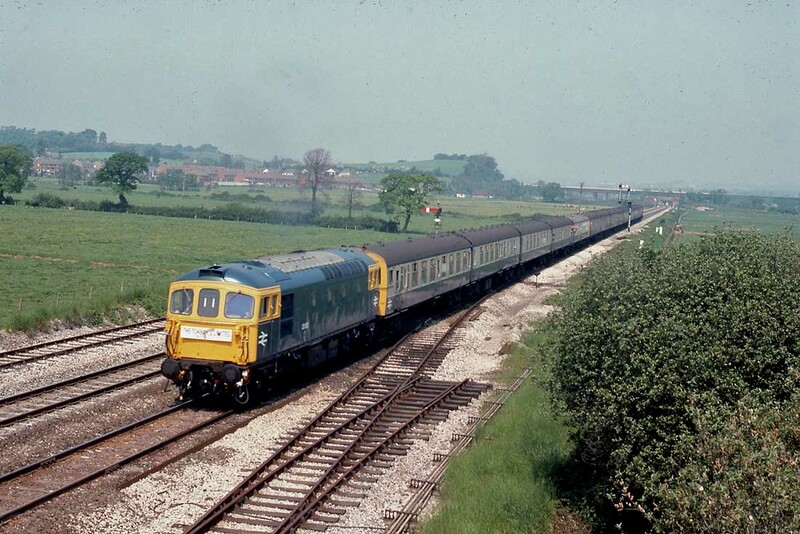 April: as in previous years a number of long distance excursions and specials from the Southern Region to Devon & Cornwall used Class 33s throughout with the trains worked over the Western Region mainline. Destinations included Buckfastleigh, Plymouth & Exeter. Additionally on April 8th 33108 was noted approaching Norwich with what may have been a Merrymaker from the Southern Region. May 6th: the Flower Parade at Spalding saw many excursions arriving, three came from Southern Region cities, with two worked throughout by a Class 33 - 33034 from Brighton and 33035 from Dover Priory. Photograph courtesy Peter Lovell. Fielding a consist that only the Southern Region could put together is this Worthing - Paignton charter with ex-works 33105, a 4TC, a MkI restaurant/buffet vehicle, 2 x 4TC and 33110 at the rear passing Exminster on a gloriously sunny May 28th 1978. Derby Day at Ascot on June 7th saw the four coach Royal Train worked from Victoria to Tattenham Corner by 73123. The empty stock was returned to Willesden by 33033. On June 10th a fuel tank at Reedham Sidings (between Purley & Coulsdon North) became derailed, 33003 was sent with the Wimbledon Park crane, but the jib was facing the wrong way. The Stewarts Lane crane then arrived with 33048 followed a short while later by the Eastleigh crane with 33113. On June 12th 73123 and a six coach Royal Train vehicles were used to convey The President & Madame Ceausescu of Romania from Gatwick Airport to Victoria. Later in the day 33056 would take the empty stock from Stewarts Lane to Willesden. On June 17th a Brighton - Kings Lynn excursion was worked throughout by 33039. Two Class 33 powered excursions from the Southern Region visited Great Yarmouth on the same day (17th), with 33011 from Wokingham and 33058 & 33048 from Brighton. A week later on June 25th the 'Devon Quarryman' railtour from Paddington to Meldon Quarry utilised the push-pull combination of 33119, 4TCs 420, 418 & 433 and 33103. For the summer season the Saturdays only Brighton - Exeter and return ran with a twelve coach set and a pair of Class 33s, instead of the normal weekday eight coach set. The additional four coaches were borrowed from a weekday Oxted set, being collected from Clapham Junction. On July 1st 33016 worked a Three Bridges - Norwich roundtrip private charter throughout. As with many excursions/charters starting from th London area of the Southern Region, the stock generally had to be worked from and returned to Clapham Junction. The High Speed Recording Coach visited the South Western Division between July 10th & 12th, the Central Division on July 13th & 17th and the Kent and London area during July 18th - 20th making several runs using 33210 (18th), 33064 (19th) & 33037 (20th). On July 29th a relief Portsmouth - Wolverhampton was worked throughout by 33025, the empty coaching stock then returned to Clapham Junction. On August 5th 33008 worked a relief Portsmouth - Wolverhampton throughout, the empty coaching stock then returned to Clapham Junction. On August 16th 74010 began its journey from Eastleigh to Derby behind 33019 as far as Clapham Junction. Two days later early on August 18th 74010 and now joined by 4PEP 4002 continued the journey to Derby with 33009 working the train to Brent Junction. Elsewhere on August 8th & 9th 74001/4/7/8/9 were making their final journey from Eastleigh to Long Marston for scrapping. On August 19th a train of exhibition Inter City stock worked from Salisbury to Crewe with 33033 throughout. On the evening of September 6th the Royal Train comprised of four vehicles, with HRH The Prince of Wales on board ran from Weymouth to Penrith, with a Class 33 working the train as far as Willesden. Due to the failure of a preceding freightliner on October 12th the 6M52 01.30 Fawley - Drakelow tank train was worked throughout by 33003 using the Southern Region driver and London Midland conductors. The locomotive returned light engine. Photograph courtesy Peter Lovell. A delightful October 15th 1978 finds 33003 passing through the remains of Seaton Junction with an unidentified passenger service. The LCGB Solent Railtour from Liverpool to Southampton on October 28th was worked by 33031 & 33112 from Havant - Cosham - Fareham - Eastleigh - Chandlers Ford - Romsey (reverse) - Southampton. The other Southern Region portions of this railtour were handled by pairs of Class 73s. The winter timetable saw the late afternoon round trip Exeter - Barnstaple passenger working diagrammed for the Class 33 which arrived in the area on a Salisbury - Meldon Quarry empties. On November 4th the Rovex Exhibition Train comprised of eight vehicles was taken from Salisbury Fisherton Yard to Bromley North hauled by 33112. During the evening of the next day (5th) 33057 took the train to Harlow Hill. On November 14th the five vehicles of the Royal Train brought the President of Portugal from Gatwick to Victoria by 73129, afterwards the empty stock was moved from Stewarts Lane to Willesden Junction by 33053. On November 23rd a Poole - Swansea charter was worked throughtout by 33011 and utilising the coaching stock from the Channel Islans Boat train. A Royal Train working on December 14th/15th carrying HRH The Prince of Wales from Salisbury to Rhyl was worked by 33028 with four coaches as far as Willesden, West London Junction. The empty stock had left Wolverton behind 86019 to Mitre Bridge, where 33028 took over for the run to Salisbury. A Penzance - Paddington service on December 17th was noted at the bufferstops at Paddington with 47029 & 33016. On December 22nd the arrival of a military special at Birmingham New Street from Wool was of considerable interest with 33023 & 33029 in charge, however events became more interesting when the locomotives derailed in the station. The bad weather which prevailed for lengthy parts of January & February caused much disruption with the resulting unusual workings reported across much of the country. An early example was the use of 33002 working throughout on a Southampton - Crewe relief on January 2nd. In the south west on New Year's Day the mid afternoon Exeter - Barnstaple utilised 33008 and coaches after the diagrammed diesel multiple unit had failed earlier in the day with various cold related mechanical and heating problems. The next day Exeter depot held twelve unserviceable diesel locomotives including 33009 & 33114. 33019 worked a Camberley - Thetford troop special throughout on January 15th, returning with the empty coaching stock later in the day. Also on 15th 33013 was noted northbound at Broxbourne with empty coaching stock. On the Southern Region the heavy snow and freezing weather from January 23rd led to a high demand for the Class 33s & 73s to assist the electric services, particularly the early morning services. After the snow had been dealt with the continued icing of conductor rails during the following days saw the strategic placement of the Class 33s across all areas of the Southern to provide quick assistance if the need arose. Two troop specials on February 2nd from Ludgershall via Basingstoke & Reading West Junction to Pembroke were worked by 33007 & 33014. Both trains contained twelve Warflats, one with two coaches the other with three. The Class 31/4s on the Bristol - Portsmouth service continued to have reliability issues, giving the Eastleigh allocated Class 33s ample opportunities to fill in when required. The Class 33s were busy elsewhere too, February 21st found 33108 working the 08.35 Poole - Liverpool as far as Birmingham, returning with the 14.38 to Paddington and then the 17.53 to Westbury, On February 22nd 33114 worked the aforementions turns. As the year wore on the Class 33s, as in recent years would be very frequent visitors to the Birmingham area on a variety of passenger & freight services. In most cases if the Class 33 didn't have a booked working home they would quickly return light engine. On February 22nd 33004 was noted northbound at Stafford with chemical tanks for Longport. Between February 19th & 22nd the Wavin Plastics Exhibition train travelled around the Southern Region. 33055 brought the train from Marylebone to Maidstone West. It then continued to Brighton, Fratton and Southampton, hauled by a variety of Class 33s, before heading to Bristol via Salisbury behind 33028. The following day (23rd) a collision between two passenger trains at Hampton Court Junction saw 33030 in attendance with the Eastleigh rerailing train and 33028 was used to remove the undamaged 4SUB coaches of the Hampton Court - Waterloo service to Thames Ditton, whilst 33009 took the undamaged stock of the Alton - Waterloo train to Wimbledon Park. On March 1st the Southern Region General Manager's saloon No.TDB 975025 was worked from Dover Marine to Redhill by 33057, from Redhill to Clapham Junction via Reading 33108 was utilised, followed by the short trip to Stewarts Lane to stable the saloon. March 10th: The 20.40 Birmingham - Paddington was worked by 50020 & 33009, with the Class 33 provided for train heating purposes. The afternoon Fawley - Langley oil tanks occasionally produced a Class 33/73 combination, so noted on March 26th were 73131 & 33002 and on April 24th 73131 & 33047. Similar combinations would continue into July. The overnight Eastleigh - Wrenthorpe car train would occassionally bring Class 33s to Peterborough, with 33110 on March 28th, 33107 on April 7th and 33112 on May 23rd. They were manned by Eastleigh crew with an ER pilot. Generally the locomotives would return light engine. The six vehicle Great Rail Club exhibition train was hauled from Salisbury to Marylebone on April 5th by 33115. On April 21st 4EPB 5358, minus its shoegear, was hauled from Selhurst to Stratford by 33057, the 4EPB spent seven days testing on the Eastern Region. During May a new Brighton - Bristol service was diagrammed for Class 33s. Its first outing on May 19th failed to reach Bristol due to a series of operating issues, none of which were attributable to the train engine, 33049. The service was turned round at Westbury. On May 6th a railtour from London commemorating the withdrawal of the Tadpole unit started out with 1203 & 1206 for a lengthy tour over Central & South Eastern Division routes. Unfortunately 1206 became defective at East Croydon. 33038 was added for the run to Brighton, Eastbourne & Hastings. Here the units were taken to St Leonards where 1206 was replaced by 1204 for the remainder of the tour. On May 21st late in the afternoon 33051 arrived at Colchester with an eleven coach charter from Dover, the locomotive and empty stock then returned to Dover. The pairing of Classes 33 & 73 on the Fawley - Langley oil train continued during May. Derby Day on June 6th saw the five coach Royal Train worked from Victoria to Tattenham Corner by 73142, 33055 was the standby locomotive at Purley, whilst 33053 took the empty stock to Willesden. During a time of shortages of electric traction on the WCML a Liverpool - Ascot excursion on June 20th was worked by 47470 as far as Clapham Junction where it failed and was rescued by two Class 73s. The return journey was worked by an ailing 33104 from Ascot to Coventry, where 86211 took over. On June 26th 33025 hauled Royal Saloon 2903, BCK 21268 & FK 13400 from Willesden to Windsor & Eton Riverside and then to Southampton Western Docks for clearances tests for 2903. 33025 then returned the Royal Saloon to Willesden and the other two coaches to Clapham. July 7th: the 05.55(SO) Weymouth - Birmingham arrived at its destination with 33111 pushing 4-TC sets 420 & 425, returning on the 11.05 to Weymouth. On July 16th 33109 hauled the seven vehicle Lever Brothers Exhibition Train from Salisbury to Marylebone. Class 33s were frequently noted at Swindon bringing electric multiple unit stock to the Works for overhaul, so noted on July 21st was 33113 with two coaches from 4CEP 7102. July: badly damaged 33036 was finally withdrawn from operating stock. For the remainder of the fleet almost twenty years of service had taken its toll. In recognition of this a heavy general & refurbishment programme was established for 1979 - 1982 with seven planned for 1979 and twenty for each of the following three years. Systemwide 39 locomotives had been out of service for more than three months, of these only one Class 33 was represented, collision damaged 33115 which had been out of service at Slade Green since February 25th. It would not re-enter service until July 1980. Slade Green and Selhurst were responsible for unclassified and collision repairs that were not handled by Eastleigh. Photograph from a BR safety pamphlet. A safety pamphlet issued by the Southern Region circa 1980 showed a variety of rolling stock damaged in recent collisions. Included in the images was this view of what is believed to be 33115 (see note above). Photograph courtesy Peter Lovell. 33030 departs Exeter St Davids, crossing the River Exe with a mixed rake of coaches on July 27th 1979 forming the 19.37 to Paignton, utilising the stock off the 15.00 from Waterloo. The side by side wrought iron bridges dated from 1896 and were replaced during October 1997 with steel/reinforced concrete structures. Photograph courtesy Peter Lovell. A nearly ex-works 33054 and sister 33053 pass Seaton Junction on August 18th 1979 with the 13.58 Exeter St Davids - Brighton. At one time Seaton Junction boasted four through lines, but by 1979 these are down to just one. More stock movements between Southern depots and Swindon Works saw 33005 move 4CEPs 7130/7142 & 7210 from Strawberry Hill. On August 15th the Southern Region General Manager's saloon TDB 975025 was hauled by 33118 from Waterloo - Portsmouth - Southampton - Havant - Chichester - Horsham - Epsom - Micham Junction - Clapham Junction. A week later on June 23rd 33109 hauled the same saloon visited Havant - West Worthing - Beeding Sidings - Brighton - Eastbourne. On August 26th excursions to the Western Region included 33051 working a Ramsgate - Weston Super Mare and 33005 on a Liss - Swansea troop special as far as Cardiff, later returning to Clapham with the empty coaching stock. The next day (27th) 33045 worked a Dover Priory - Barry Island mystery tour throughout. On September 5th immaculately turned out 33027 & 33056 worked Earl Mountbatten's eight coach funeral train from Waterloo to Romsey following the funeral service held at Westminster Abbey. Some of the stock had recently been used to bring the Queen back from Balmoral to London, a Class 33 then being sent to Euston to bring the stock to Waterloo. On September 26th a slow journey for 33027 occurred as Class 9F 92203 was towed from Marchwood to Cranmore which included several reversals, with speeds varying between 5mph & 25mph. A very unusual event on October 25th was the arrival of a Class 33 at Euston to collect some Royal Train coaches, used to bring Her Majesty The Queen from Balmoral to London, for further delivery to Waterloo. The three vehicle Derby Research Center Tribometer train was moved from Derby to Ashford on November 1st, with 45072 taking the train to Brent, then 33057 to Ashford. Commencing November 5th one round trip Exeter - Waterloo turn was booked for Class 50s for crew training pending their introduction on these services in the 1980 timetable. On November 6th a Blackwater - Okehampton troop special was worked throughout by 33016, the return was worked by 33104 on November 9th. On November 8th a Wool - Birmingham special was worked by 33006 & 33114, the locomotives returned the empty stock to Clapham Junction. On November 24th the three vehicle Derby Research Center Tribometer train returned from Ashford to Derby, with 33063 taking the train as far as Brent. The Westbury - Aldermaston & Totton - Westbury stone workings occasionally featured pairs of Class 33s when the diagrammed Class 47's were not available during November & December. During October & November double headed Class 33s worked a Tonbridge - Westbury and return stone train. Whilst laying over they frequently covered turns to Fareham, Merehead and Aldermaston. In the New Year the Class 33s would gain a working from Woking to Tytherington Quarry. Two Class 33s, including 33202 were noted at Colchester with troop trains on December 2nd. On December 21st a Brighton - Wolverhampton football special, which included the manager and team was worked throughout by 33055. The Class 33 was serviced at Saltley. Page added July 29th 2012. The Class 33s: 1990 - ? ?